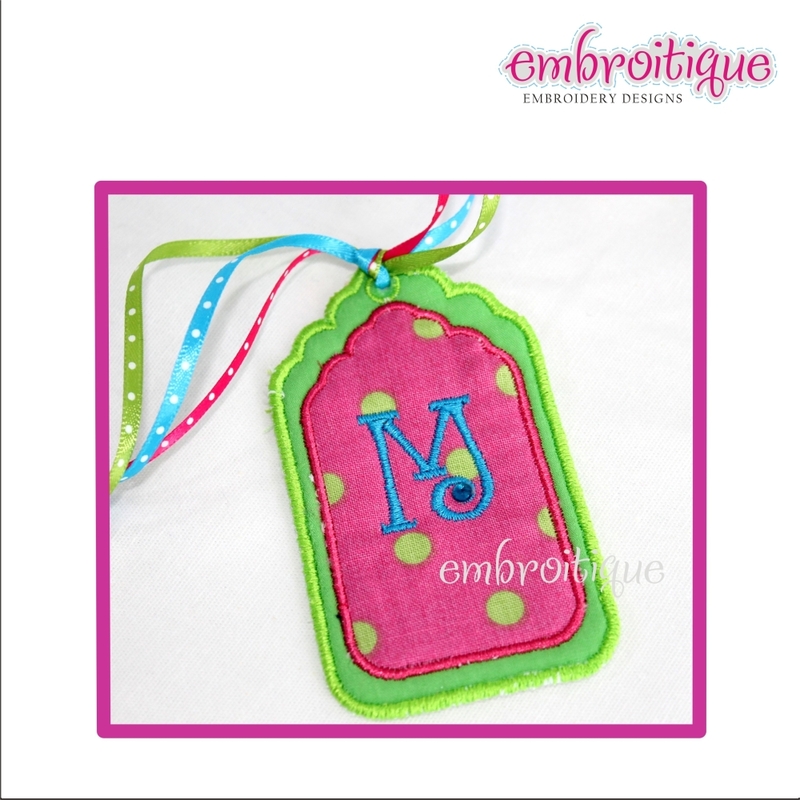 Scalloped Rectangle Gift Tag - 4 Sizes! The options for these tags are endless! Stitch out the larger sizes and add in a name or initial to put on a gift - but later can be used as a bag tag for back packs or lunch boxes! We paired the hot pink tag with our Beanie Monogram- each sold separately. The smaller sized tags make perfect tags for wedding or baby shower favors...or even used as place cards for a holiday table scape. Includes two versions, a double applique front and a single one. Each style includes four sizes. No font is included with this design. The options for these tags are endless! Stitch out the larger sizes and add in a name or initial to put on a gift - but later can be used as a bag tag for back packs or lunch boxes! We paired the hot pink tag with our Beanie Monogram- each sold separately. The smaller sized tags make perfect tags for wedding or baby shower favors...or even used as place cards for a holiday table scape. Includes two versions, a double applique front and a single one. Each style includes four sizes. No font is included with this design. 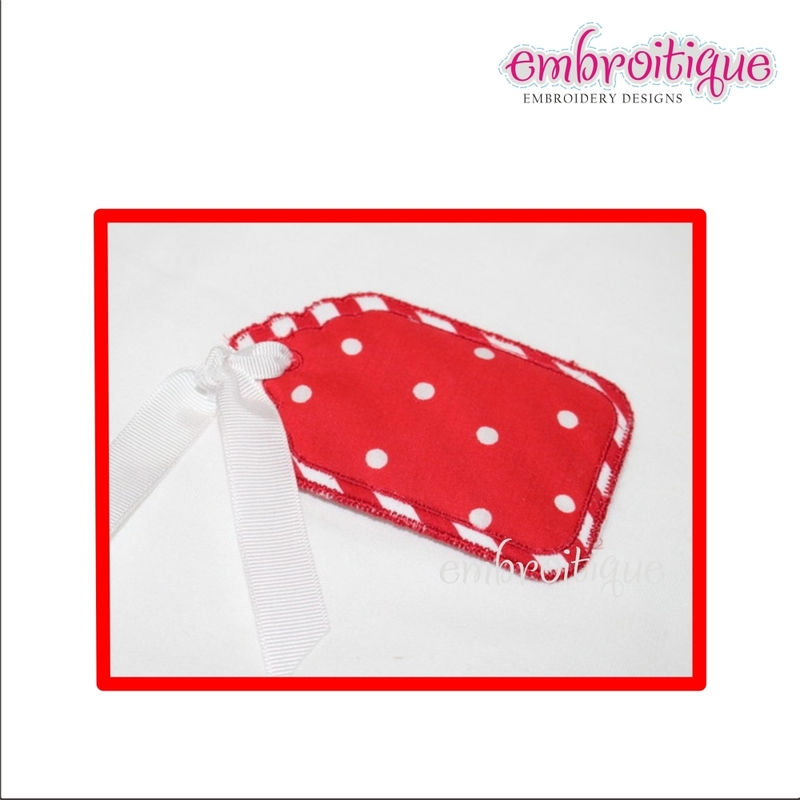 Folded Favor Gift Card Holder 2 - 3 Sizes! Vintage Reindeer Silhouette Raw Edge Applique - 6 Sizes! Christmas Cheer Block - 7 Sizes! Beanie Monogram Set - 4 Sizes! Finish Size 1.0" x 1.8"
Finish Size 1.6" x 2.8"
Finish Size 2.1" x 3.8"
Finish Size 2.7" x 4.8"